PRESS RELEASE - The U.S. Track & Field and Cross-Country Coaches Association (USTFCCCA) announced the state-by-state winners of its fourth annual High School Coach of the Year award for cross country on Wednesday. One boys' coach and one girls' coach from each of the 50 states and the District of Columbia - as seen in the lists below - were honored for their successes during the fall of 2018, as selected by a committee of experts from around the nation. The winners from each state are in consideration for the association's National High School Cross Country Coach of the Year award. One boys' coach and one girls' coach from among all the states will be selected by a panel of experts and be announced later this month as the national winners. This year's Arizona Coach of the Year award went to Flagstaff HS Head Coach, Trina Painter. For the past three cross-country seasons, the Flagstaff Eagles had dominated the Division 2 State Titles despite not having raced many of their rivals to the south until Sectionals and State. This past fall, they opened their season with runner-up finishes at the Peaks XC Invitational. They went on to sweep the team victories at their next two invitationals, Four Corners and Shane Morris, and then ventured to Santa Clarita for the Master's College Mustang Challenge where the Boys placed 3rd and the Girls placed 6th at their fastest invitational of the season. 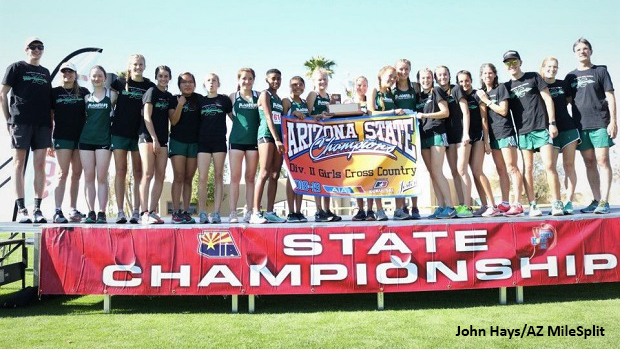 Their first race in Phoenix, was the Rose Mofford Sectionals which they handily won nine days before returning to the valley for the AIA State Cros Country Championships. At Cave Creek Golf Course, the Flagstaff boys picked up 128 points and the girls secured the D2 State Title with 94 points to complete their sweep of the team titles for the fourth consecutive year. In addition to the team titles, Flagstaff newcomer Hana Hall picked up her first State Title. A week after State, Hall qualified for Nike Cross Nationals after finishing 2nd in the Southwest Regional Girls Championship.